Brian Greenfield is a Catholic evangelist with a strong background in youth and young adult ministry. He is currently the director of campus ministry at Jesuit High School in Tampa, and is a speaker for Hard as Nails Ministry. Brian lives in Spring Hill, Florida, with his wife and their two children. So far this week we've discussed two great tools to help us become the-best-version-of-ourselves. Our habits are how we change, and recognizing what matters most and what matters least helps us to know what to change. The last step is doing it. And that requires being able to say "yes" to those most important things and "no" to the distractions. Every year my children's school Christmas play is a special type of agony. It's one more demand during an already demanding season . . . and the Christmas show is on a school night . . . and the rehearsals interfere with my teaching schedule. Outside of the five minutes that my kids are actually singing, the rest of it is a total act of love and patience. Sometimes I wonder if I should just say no to the whole thing. But I always say yes. I make sure my daughter knows I'm excited to see her show, and I assure my son that I can't wait to see him in the show next year. I say yes because I love my children more than I love my comfort. I say yes because I believe that my sacrifice will cause them to be whole and happy, and be better for me and my family. When faced with a decision, I've learned to take a moment and ask God to help me recognize what matters most. 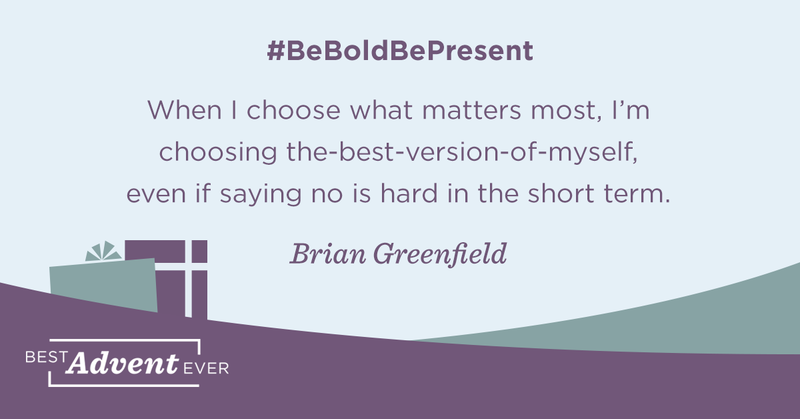 Because when I choose what matters most, I'm choosing the-best-version-of-myself. How do we do it? We become aware of the habits, both the good ones and the distractions. We let our ability to recognize what matters most drive our decision-making. And then we practice. When we make the best decisions, when we say "yes" to the right things, then we've discovered the key to the best Advent ever and a great Christmas. Tomorrow we're going to hear from John, who's going to share some of his family's best Christmas traditions. The only way to say "no" to anything is to have a deeper "yes." Every "no" is a deeper "yes" to your essential purpose, to what matters most. Every decision we make either makes us a-better-version-of-ourselves or a-second-rate-version-of-ourselves. 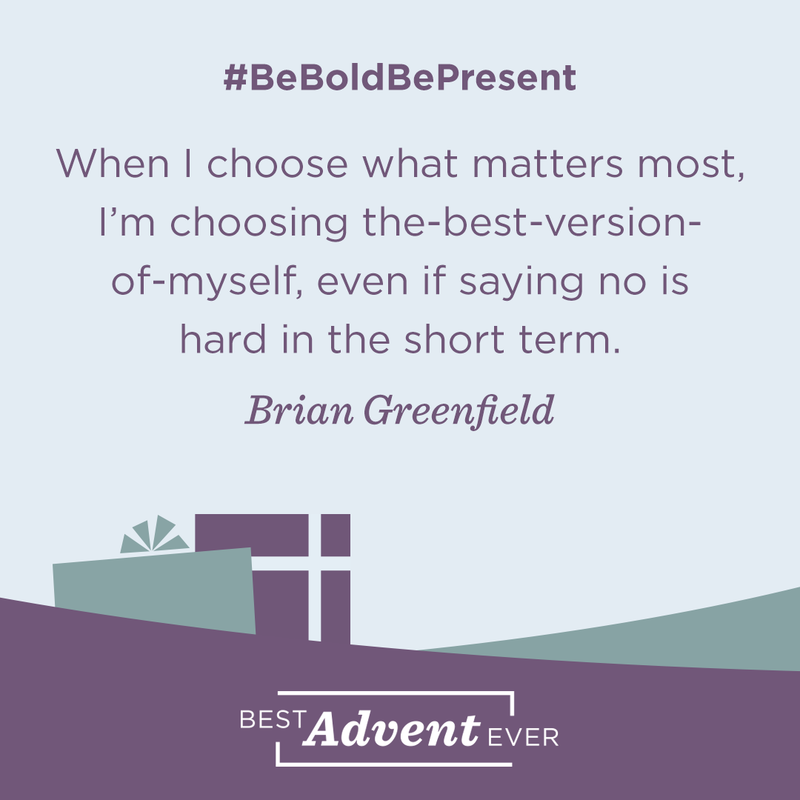 When we are great at saying yes and no, when we are in touch with our deeper "yes," we will have a great Christmas. The only way to say "no" to anything is to have a deeper "yes." Jesus, help me to say "yes" to my deeper purpose.